Other faculty members on the panel discussed recent decisions by other institutions of higher education such as Stanford University and Middlebury College to divest from the fossil fuel industry as well as the political consequences of Harvard’s divestment from fossil fuels. “When are the moments in which Harvard can have immense influence in society and decide to be an ethical thermostat rather than apolitical thermometer?” West said. “I think that that was an unparalleled kind of opportunity that I'm very appreciative that we had the chance to see out in real life tonight,” Cohen said of Bacow’s presence on the panel. After the moderated portion of the forum, Harvard affiliates asked questions of the panelists. 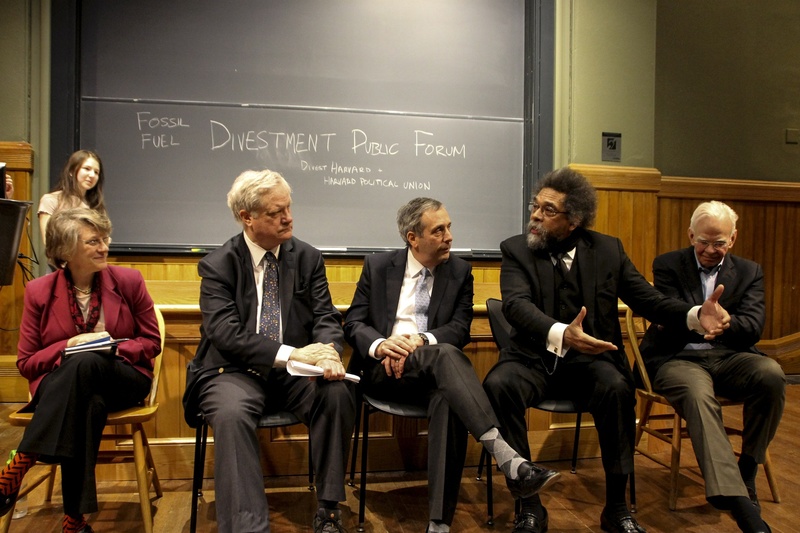 HPDC member Salma Abdelrahman ’20 accused Bacow of prioritizing dialogue with the fossil fuel divestment movement over the prison divestment movement. “I just wanted to call out what racism looks like,” Abdelrahman said. Bacow also said that Harvard faculty and affiliates have produced prominent scholarship about mass incarceration. “This is something that, unlike the fossil fuel divestment issue, which has been on the agenda of the Corporation and the University for a long time, to my knowledge, has not been before us previously,” Bacow said. Thursday’s forum comes ahead of a revitalized “Heat Week” campaign set to take place during the last week of April. “Heat Week” originally began as week-long protest organized by Divest Harvard in April 2015. Hundreds of students and several faculty members blockaded Massachusetts Hall for a week, occupied the Harvard Alumni Association headquarters for two days, and blockaded University Hall multiple times.